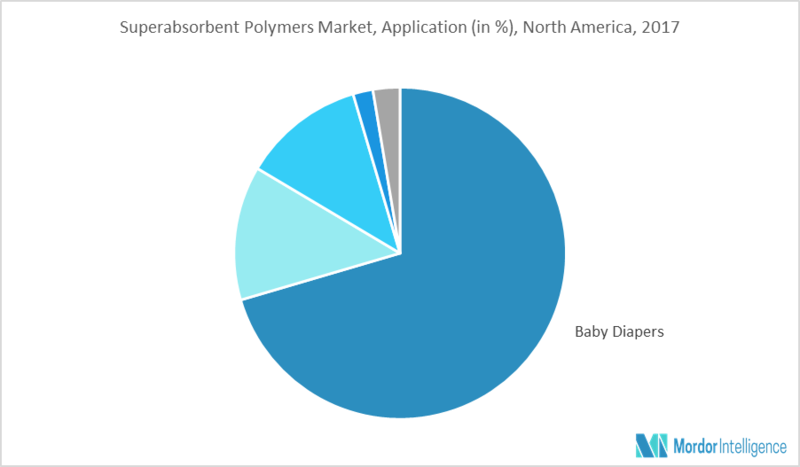 The North America superabsorbent polymers (SAPs) market is expected to witness a steady growth rate during the forecast period, 2018 - 2023. United States dominated the North America superabsorbent polymers market in 2017. The number of Americans ages 65 and older is projected to more than double from 46 million at present to over 98 million by 2060, and the 65-and-older age group’s share of the total population will rise to nearly 24% from 15% in 2015. As the aging population continues the need for adult incontinence products too will rise, which is used in nursing homes and hospitals to provide considerable advantages to both patients and nursing staff. Presently, the market for incontinence products has grown significantly, due to increasing popularity in home care environment. They are an important tool in enabling people with incontinence problems to manage within their own homes rather than having to resort to nursing care. A baby’s diaper requires about 13 grams of superabsorbent polymers. Superabsorbent polymers in baby diapers absorb about 30 times their weight in urine. The swollen gel holds the liquid in a solid, rubbery state and prevents the liquid from leaking onto the baby’s skin and clothing. The polymer starts as a powder and it swells into gel form when it encounters moisture. The moisture cannot be squeezed out of this gel, which makes it efficient for use in diapers -- baby can sit on it and even sleep for hours in a wet diaper. Owing to such features, superabsorbent polymers are widely sued in baby diapers. North America has the largest market for baby diapers in the global market. As the market continues to grow, the consumption of super absorbent polymers too will rise through the forecast period. United States has the largest market for baby diapers in North America and ranks among the top in the global market. The baby diaper market in the country is expected to grow at around 1% in the coming years. Immense focus on the hygiene factor, increased spending on healthcare and medical products has hugely contributed to the growing use of sanitary products in the country, which in turn is driving the use of superabsorbent polymers in the country. Major players: BASF SE, Evonik Industries AG, LG Chem, Nippon Shokubai Co. Ltd., and Archer Daniels Midland Company, among others. 8.8 Nippon Shokubai Co. Ltd.
8.9 Songwon Industrial Co. Ltd.
8.10 Sumitomo Seika Chemicals Co. Ltd.
8.11 Wanhua Chemical (America) Co., Ltd.